1986, Starring Karen Elkin, Michael Blouin, Michael J. Anderson, Ken Roberts, Lorraine Desmarais. Directed by Vojtech Jasny (La Fete). In the fifth installment of his internationally acclaimed (and Canuxploitation-approved) "Tales For All" series, kiddie film kingpin Rock Demers and his production company La Fte unleashed a real oddity--a half-baked fantasy about alternate worlds, magic gold dust, and a puking boulder. 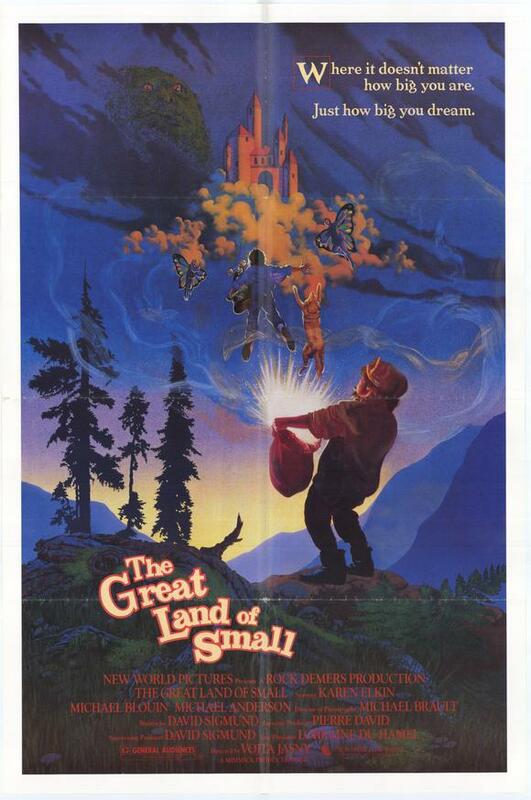 Despite recruiting a then-unknown Cirque du Soleil to add some visual flair to his whimsical children's adventure, The Great Land of Small is still one of Demers' less successful efforts, a derivative fairy tale that demands a budget beyond La Fete's simple means. The film begins as precocious American siblings Jenny (Karen Elkin) and David (Michael Blouin) head to rural Quebec with their mom for a weekend stay at their grandparents' house. 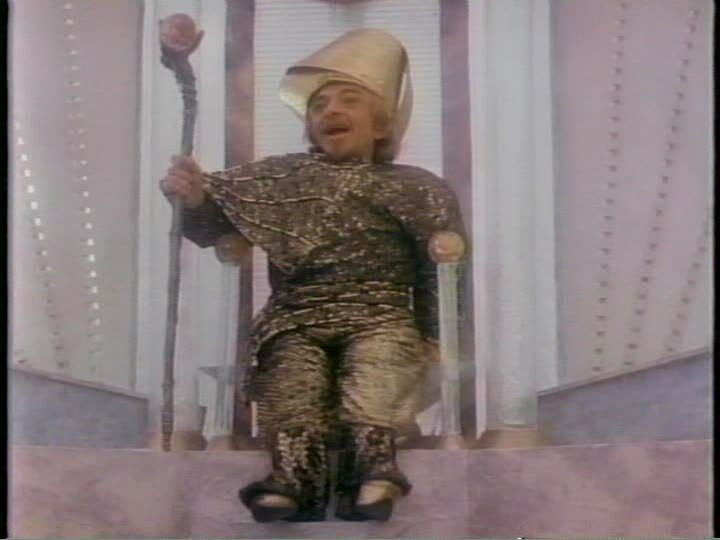 There, while playing in the woods, they meet of Fritz (Michael J. Anderson, best known as the backwards-talking little person in Twin Peaks), a strange, leprechaun-like creature who is invisible to non-believing adults. Temporarily trapped on Earth after he misses the last rainbow home, Fritz explains he has lost his sack of magic gold dust to Mr. Flannigan (Ken Roberts), a greedy hunter who lives in the area, and convinces the children to help him recover it. On the lookout for more treasures, Flannigan and his goons soon spot the trio, forcing Fritz and his friends to escape by canoe and wish their way into his world, the Great Land of Small. While the teary-eyed adults troll the riverbed for Jenny and David's bodies in reality, the kids are blissfully unaware in a far-off world of wonder, as they see human butterflies, meet the Queen (who looks suspiciously like their mother) and bow down to the dimension's deity, an anthropomorphic ball of rock named Slimo. With the help of Munch (Ken Roberts, again) and his human-like dog Gardien (Andre Melanon), Jenny and David have everything they need to head back to their world and get the gold dust back from that pesky Mr. Flannigan once and for all. Like all of La Fete's productions, The Great Land of Small is advertised as "rated G for Great Family Entertainment," but in this case, a more appropriate rating might be W, for "What the Hell?" 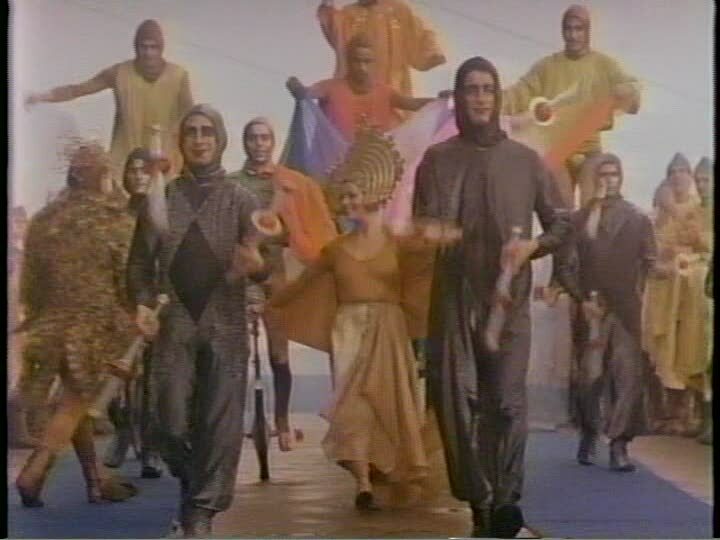 Weird, but not actually trippy enough to be interesting, the film struggles to offer a reason for its existence beyond the inclusion of the Cirque du Soleil, offering up insipid songs by Nathalie Carsen, and shamelessly borrowing ideas from the long tradition of children's fantasy films. The beginning of the film is tediously padded, especially once Jenny and David take the marooned Fritz back to their place. There, the little elf gets into minor mischief around the house, magically teleports their dog from a kennel in New York and reminisces grandly about his alternate world. Even more awkward is a subplot in which an almost completely incidental hobo named Mimmick (Rodrigue Tremblay) clashes with the evil Flannigan. Finally, about halfway though, the film gets in gear and crosses over into the much-talked-about Great Land of Small, but as an fantasyland, it's a distinct disappointment, with embarrassingly low-budget production design, and cheap editing tricks, guide wires and a few flashes of animation standing in for the much touted magic. It's clear that Demers' creative team had envisioned a world not unlike the Land of Oz or The Neverending Story's Fantasia, but we never get much of a sense of the Land of Small's greatness, which is always obscured by smoke machine haze and a series of unfortunate matte paintings. That's not too surprising, since La Fte was obviously banking on the "charming" performances of Le Cirque de Soleil to distract viewers from its rendering of this sorely lacking alternate realm. Poised on the brink of worldwide breakout success, Cirque de Soleil had spent the last four years building itself up from a group of ragtag Montreal street performers into a circus-cabaret of visual stylists, and had just recently begun to tour its show beyond Quebec when the troupe appeared in the film. 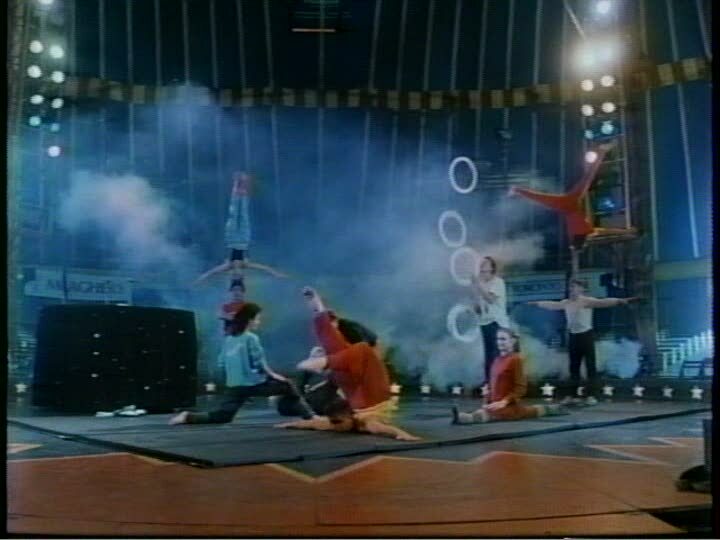 The Great Land of Small makes good use of the budding superstars, populating its world with a menagerie of brightly-dressed jugglers, unicycle riders and acrobats who do everything from featured trapeze stunts to subtle background performances to give each scene a sense of dreamlike dynamism. 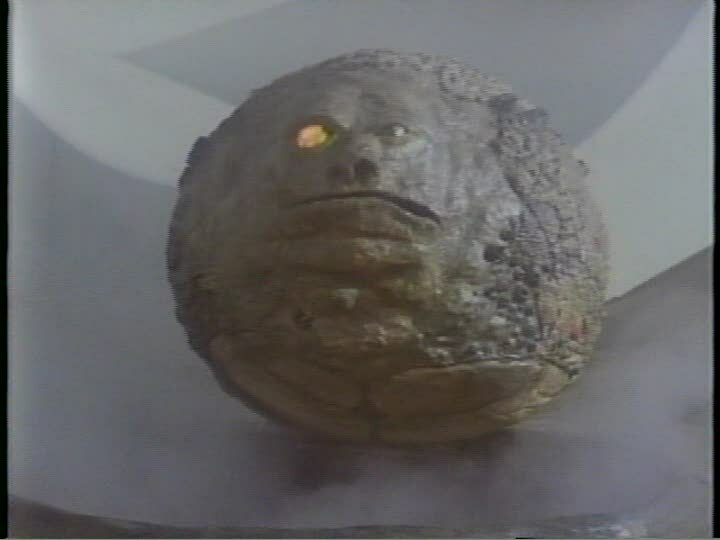 Unfortunately, the Cirque de Soleil performers are all but forgotten once we delve deeper into the one-set world and lay eyes on the badly-designed Slimo, a fleshy, floating rock with a distinct, carved-out face. Resembling a more genial version of the killer gray matter in Ed Hunt's The Brain, the world's inhabitants slide down a ramp into Slimo's maw, and are transformed into a variety of different creatures. As the crowd cheers "Slimo! Slimo!," the hovering mass then belches out streams of magic gold dust for apparently no reason whatsoever. It's an unforgettable sight, and quickly kills whatever momentum the film had been building with a reminder of just how ill-conceived the Land of Small is. Though not a full-fledged co-production, The Great Land of Small retains an international flavour courtesy of Vojta Jasny, a veteran Czech director whose 1963 children's film The Cat Who Wore Sunglasses must have impressed Demers enough to hire him for this project. Unfortunately, the conflicting European and North American sensibilities of the film leave an uneasy, off-kilter impression on the viewer, with unclear motives, 360-degree plot turns and arbitrary uses of magic that make the film seem like an absurdly dubbed K. Gordon Murray Mexican kiddie matinee import. It just feels like something has been lost in the translation--if it hadn't undoubtedly been shot in the Great White North--as the film indiscriminately drops dead-end plot threads and ignores obvious questions. For example, why does every real world character seem to have a Great Land of Small counterpart--was their trip through the rainbow all supposed to be a hallucinatory dream? Of course, by the end of the film, it really doesn't matter what the director's intentions were, because this sub-par effort falls victim to a lack of budget and vision that even Cirque de Soleil can't make up for. There may be quite a bit of talk about the enchanting power of magic in The Great Land of Small, but don't be fooled--the film itself contains none at all. Canuxploitation fans on the lookout for some pint-sized thrills are better off sticking with one of Demers' more accomplished efforts, like The Peanut Butter Solution.